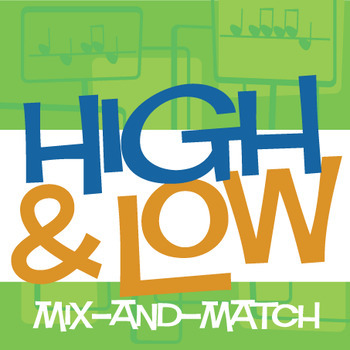 The mini-bundle features four activity worksheets for K-2 students to help with beginning level pitch discrimination, and the Mystery Message Game as a follow-up activity for 2nd grade students. Great for ear training and developing higher order thinking skills! Students listen to each high-low note example. Then they decide if the second note is higher or lower than the first. 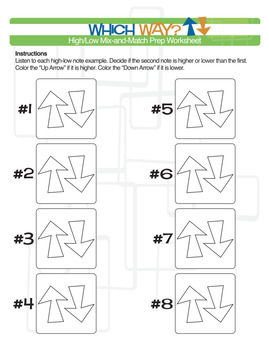 They color the “Up Arrow” if it is higher or the “Down Arrow” if it is lower. 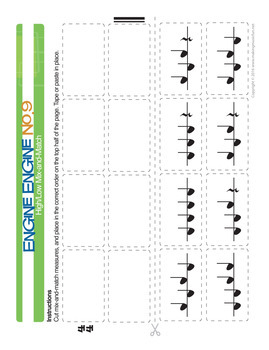 Students learn the song, cut out mix-and-match measures, and place them in the correct order based on the high/low patterns they hear, and then tape/paste them in place. The Mystery Message Game is "Hangman" with a musical twist. Students listen to one measure high/low patterns played with simple rhythms, and then check the Mystery Message Game code sheet to figure out what letter it is. If they guess the word before everyone else, they win. 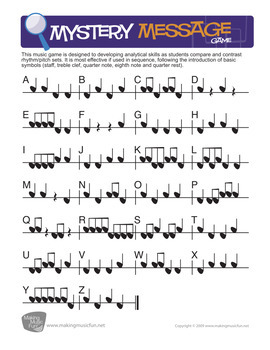 Objective: Students listen to and compare high/low patterns played with simple rhythms for the purpose of training higher order thinking skills, including analysis and compare & contrast. Unlimited copies for you and your students. However, you may not distribute additional copies to friends or fellow teachers. Follow me on TeachersPayTeachers.com to stay updated with discounts and freebies. New products will be offered for free on occasion, or discounted 20% during the first 24 hours. Your feedback brightens our day and helps us continually improve our products. If you download this, we'd appreciate it if you'd leave a comment. Thanks!